Many have scoffed and ridiculed this series of articles as unneeded and so forth. But on December 24, 2013 Fox News was broadcasting a documentary [sic] called The Nativity. I caught a bit of this program after returning home from our church service. There on the most widely watched cable news channel stood a Lady talking head explaining how December 25 could not be the birthday of Jesus as it was in December. She continued on how December 25 is in the middle of the winter and the shepherds would not be able to withstand the "frigid" conditions. There has not been a recorded temperature below freezing in the Month of December in 2013 in Jerusalem, Israel! These temperature reading are at an elevation of over 2,000 ft and will be colder than where the shepherds would have tending their flocks. The truth is that the historical records show that the average lows in Jerusalem are almost identical to Lake City, Florida. I would invite any and all that believe that December in Jerusalem is "frigid" to visit the modern day Battle of Olustee, just outside Lake City, Florida in February. Here you will see re-enactors living for the weekend in much the same manner as shepherds would have in the time of Jesus. February in Lake City is colder than December in Jerusalem. These statements about being too cold are made for the purpose of discrediting Christianity. Those who make them have spent less than five minutes researching the historical data! That is how long it takes to access the Weather Channel historical data for Jerusalem, Israel! So these false claims are not the result of an actual investigation or research! 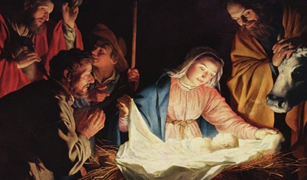 No, the Bible does not tell us that Jesus was born on December 25. The Bible does not tell us what day Jesus was born. But that does not justify deception: nor remaining silent when you hear deception. This talking head was spreading deception! But the Bible does tell us in 2 Thessalonians 2:3 that as we approach the end of the age there will be a falling away. Falling away means --- departure from the truth. The Bible does tell us there will be deception, those who will try to mislead and discredit. The Bible also tells us that many have ears but do not hear, have eyes and do not see.